Melanged Magic: Have You Seen My Shower? Have You Seen My Shower? Have you seen my shower?? C'est tres magnifique! Just look at all those gadgets! It's definitely not something I'd ordinarily have for myself, but it's here, it's so Patrick, and I love it! It's totally enclosed, so unless I have the fan on, it functions as a steam shower. I can shower with the regular shower head at the left, or I can turn on the 'rain' head on top. Then it's like standing under a gentle waterfall or standing in a warm rain. The jets across the back allow me to have directed, pulsating spray in two different areas. Great for sore muscles. I can even sit down in front of them to further direct their massaging action. It has a light and as I said above, a fan. Oh yes...it's also equipped with an FM radio! I can listen to French music while I shower. What luxury! 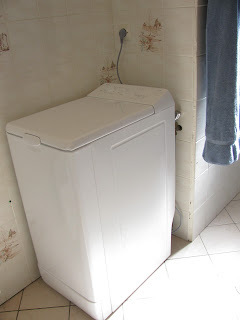 My second favorite thing about my bathroom is my petite washing machine. I bought it at BUT soon after I arrived and it fits perfectly in this little niche where the hookups are. The tub rotates like a ferris wheel...quite ingenious how it fits in the small space. The first time I opened it, I remembered Laury told me that the first time she opened her machine (she has the same model), she accidently locked it and thought she had broken it before she even used it. Of course, I had a similar misadventure when I tried to open the tub. The bottom of the tub was visible when I lifted the lid. Heck, what do I know? I thought it was the top, and sure enough it had a lever that opened it. When I pushed it, it immediately fell into the tub leaving a gaping opening. OMG! I couldn't get it back in place and was sure that I had ruined the machine. Luckily, I thought to rotate the tub which brought the real opening into view. I pushed the button and voila! it opened the proper way, and I could reach in and replace the piece that had fallen in. Evidently, it is the bottom of the tub and can be removed if you need to manually drain it. I've washed several loads of clothing, and I couldn't be more pleased. I've used the 'rapide' setting which does a load in around 30 minutes and gets my clothes sparkling clean. The wash cycles for 'coton' and 'coloures' last up to 2 hours! 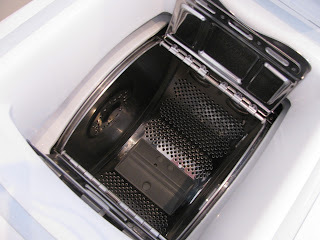 I can't imagine how clean my clothes would be after a few washings on those settings...if I even had any clothes left! Your house looks absolutely charming, and comfy, and a perfect spot to spend a winter and beyond. 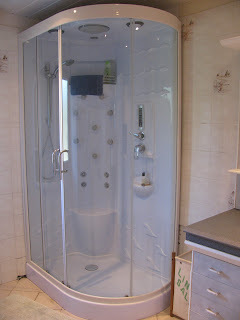 The shower stall is much like one I had at the Sheraton Airport hotel, Charles de Gaulle, so feel pampered. I had the exact same washing machine when I rented an apartment from Saignon friends a few years ago. It is a mystery to me why French washing machines take such a long time to cycle.